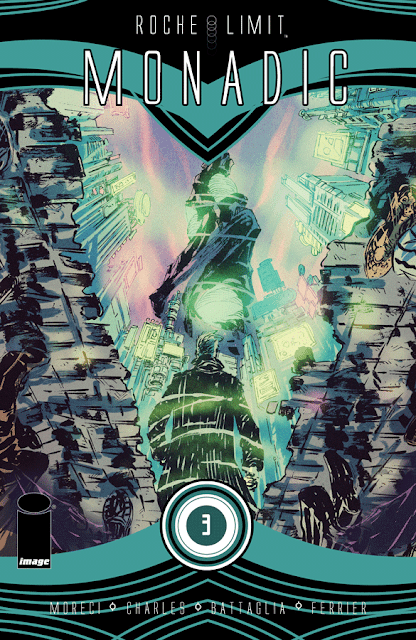 Roche Limit Monadic is one of the few science fiction titles that challenges your mind as well as quicken your pulse. There are some existential questions for Sasha and others as this limited series comes to the penultimate issue. As such, we get some answers and the mission to unravel the mystery of this seemingly dreamlike world and the dark god behind it becomes clearer. (Spoilers ahead). The sad death of Alex ignites an idea in Sonya to attempt to capture the soul of Moscow if they’re able to kill him at all. It’s a last ditch effort to escape the threats that have befallen her team. She assembles them to march on the dark tower to face an all-too-willing Moscow. Sasha and her family continue on their water voyage in one of the most heartbreaking sequences you’ll find in comics. She desperately clings to her daughter despite knowing the uncertainty of this manipulated reality. Her husband standing by her as she bravely deduces what it’ll take not only to survive but conquer this world. Michael Moreci writes Sasha as one of the most courageous and mentally strong characters in the series and serves as the glue that keeps readers engaged in the hopes she’ll find true peace and happiness. Danny reemerges after decades when Sasha reaches out to him. Danny has long been a compelling character as an android with conflicted motives and in this situation, he’s had enough but is willing to help Sasha nonetheless. There is a convergence of storylines that lead into the finale yet mysteries remain. What lurks in the dark tower and just how will they collapse the anomaly? Knowing Moreci’s penchant for thought-provoking spectacle, the final issue is sure to be a mind-blowing event. How and what will Bekkah accomplish with Moscow’s soul if they’re able to defeat him? Will it lead to tower access? There’s been this build-up of the tower so expectations are high as to what exactly is within its walls. Kyle Charles’ scratchy pencils and Matt Battaglia’s warm bold colors don’t show their hands when it comes to trying to determine what’s real and what are projections. It all looks real and that’s the point but the Anomaly ultimately fails to understand human beings despite creating this almost mirror image. Charles and Battaglia create a surreal and dreamlike state that borders on abstract but it’s really the quieter smaller moments that shine in this issue. Whether it’s Sasha’s tormented look in her face on the boat or the solemn purple panel of Bekkah holding an expired Alex, the artists find great depth and emotion in the simple things of a much more complicated landscape. Roche Limit should be read in its entirety to really get the full effect of this sci-fi drama. Get issues 1,2, and 3 in preparation for the final issue next month. It’s worth the investment in something that messes with your head, punches you in the gut, and keeps you asking for more. Moreci, Charles, and Battaglia have another mind-bender in Roche Limit Monadic and they’ve set the stage for an epic conclusion. For all its darkness and danger the underlying story remains the unyielding yearning for survival and pursuit of peace amid the world designed to manipulate and destroy its inhabitants. The ending could go many different ways, probably at the sacrifice of many characters, but we’ll have to wait to find out. Chances are we won’t see the finale coming and that’s how it should be.